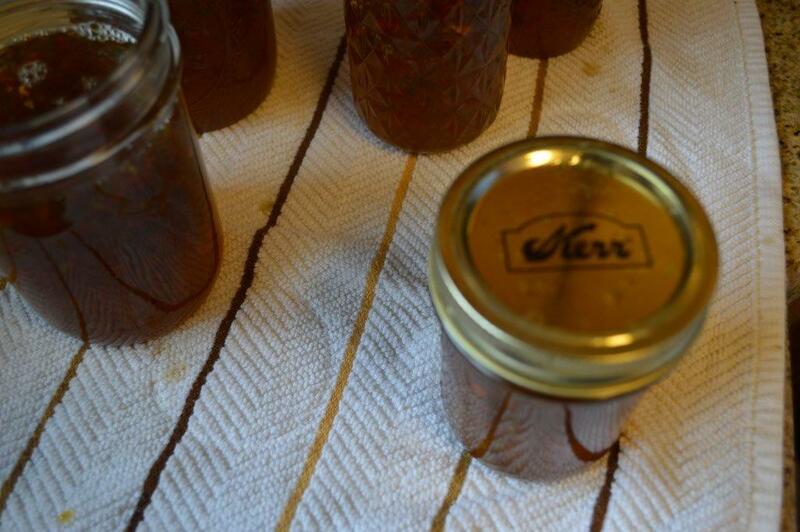 Over the past three decades of married life, I am positive I have bottled thousands of homegrown yumminess. I used all kinds of available veggies and fruit and bottled them as close to their natural state as possible, to exotic flavors of canned treats. 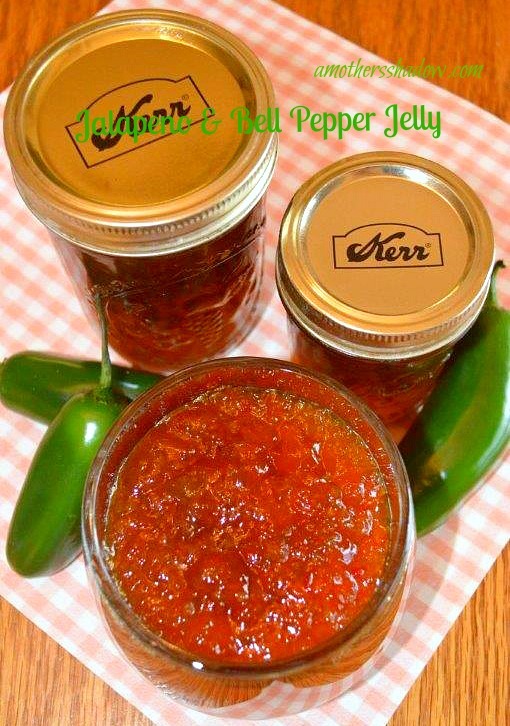 If I had to pick one of my favorites, THIS Jalapeno and Bell Pepper Jelly would make the top 10 for sure. 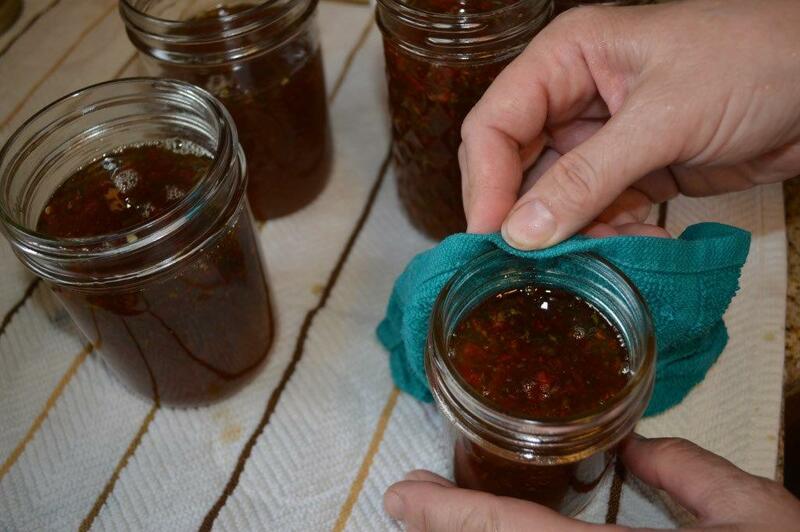 I love, love, LOVE this Jalapeno and Bell Pepper Jelly. It can be made any time of year, and not expensively. A wonderful gift for any holiday or to take as a thank you to a hostess of a party. 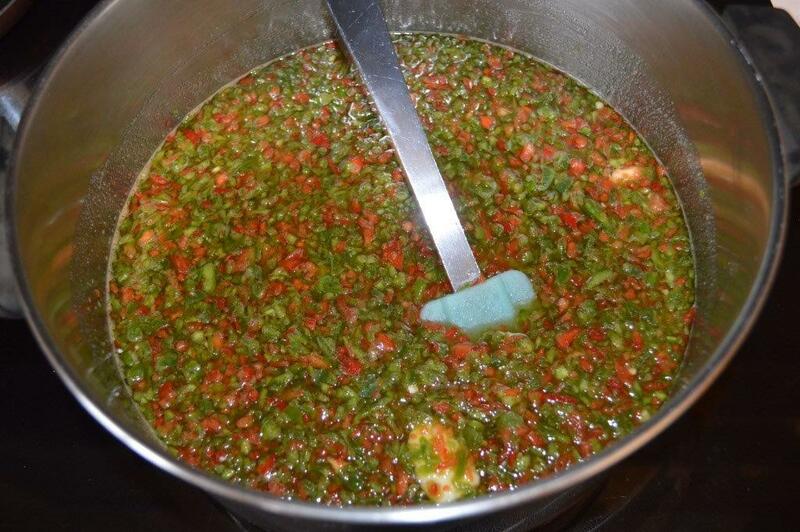 Though made with jalapeno, it is NOT hot, it just has a tiny zing for flavor. I know it takes a little extra time, but I have had best results over the years if I do NOT double this recipe. 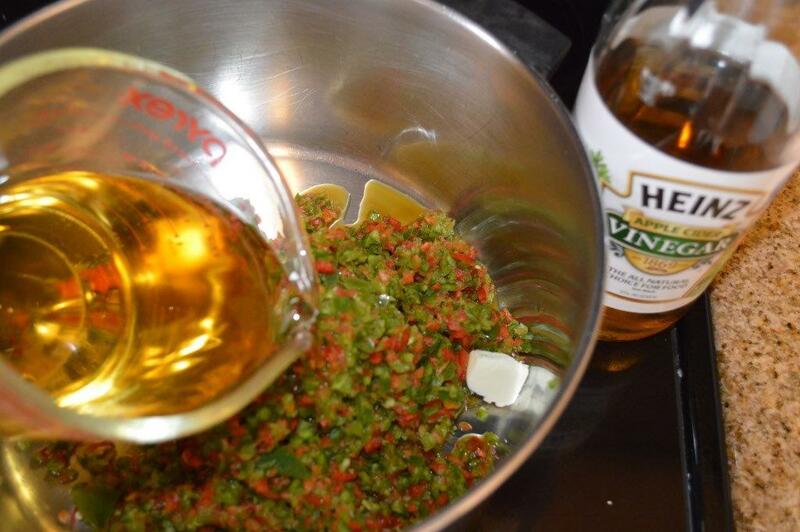 It sets up and is a fabulous consistency and taste. 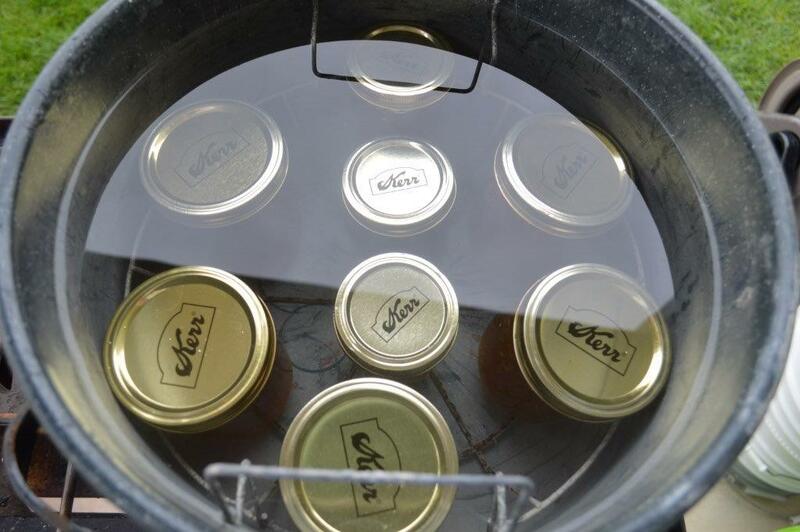 Tip: I used my Camp Chef with the canner and it works perfectly. IF you have bad weather and move it all into the garage, do NOT shut the garage door! Give plenty of ventilation to prevent any health risks. 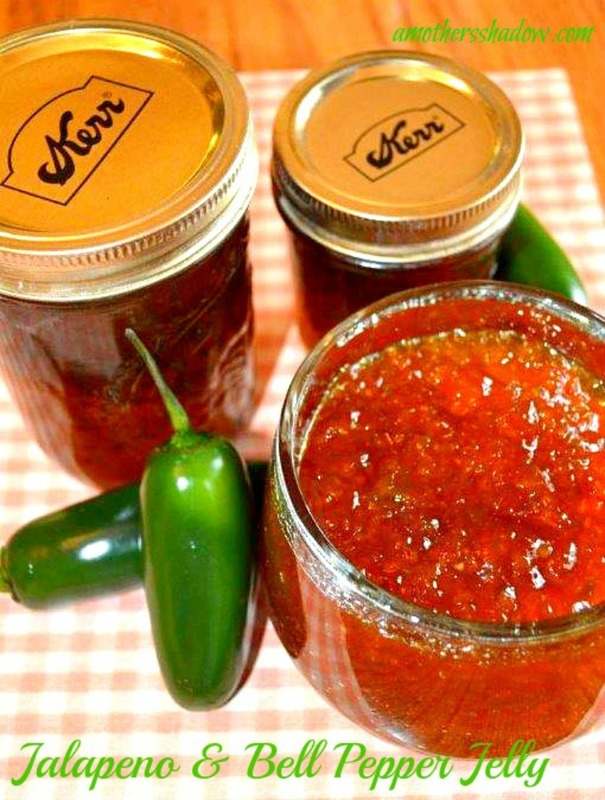 Now, gather up the supplies, borrow from your mom or neighbor and get making this delectable condiment today. Please click through the pages for the recipe. 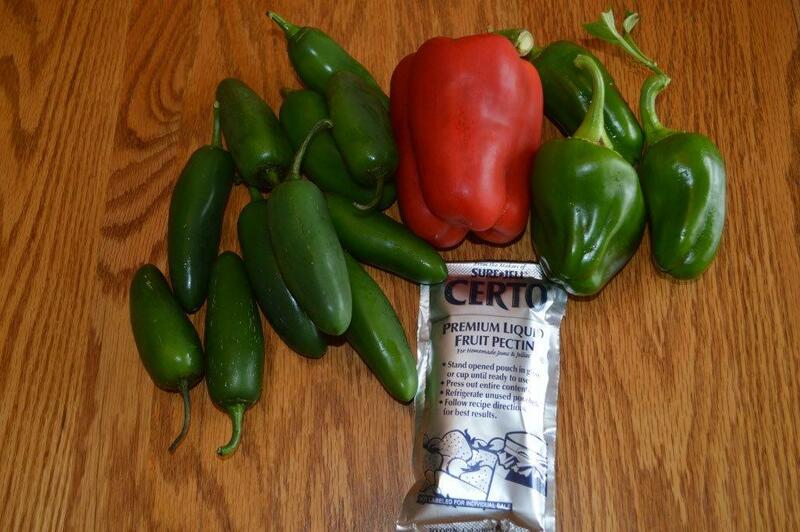 You need jalapenos and 2 bell peppers. 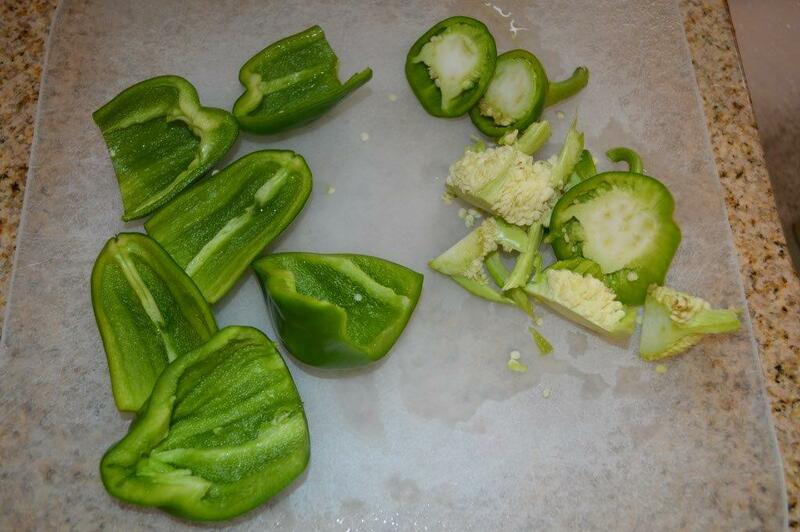 The peppers in my garden were a tad small, so it took a few to make the large one. 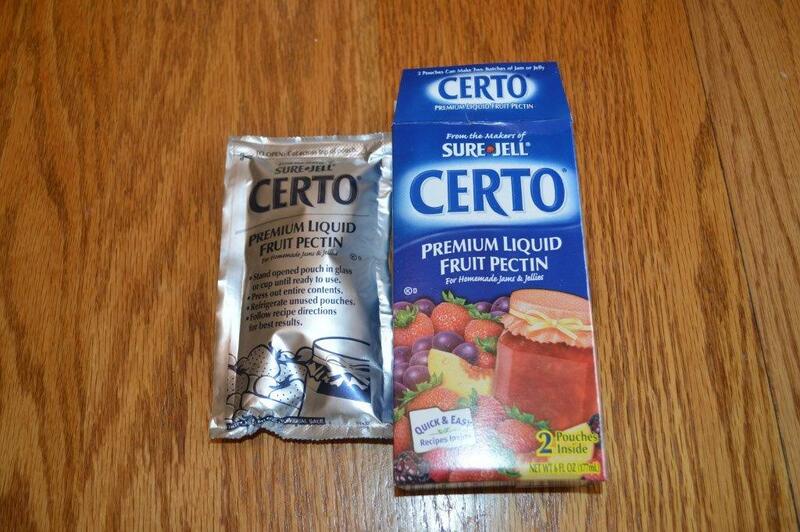 The liquid pectin comes in a box with 2 envelopes. I keep a box of disposable gloves on hand to use whenever working with hot peppers. Do yourself a favor and use a hairnet. You can get one at the bakery for a nominal cost, or have a supply on hand. It is so unsavory and unappetizing, not to mention down-right embarrassing, if someone finds your hair in their food. 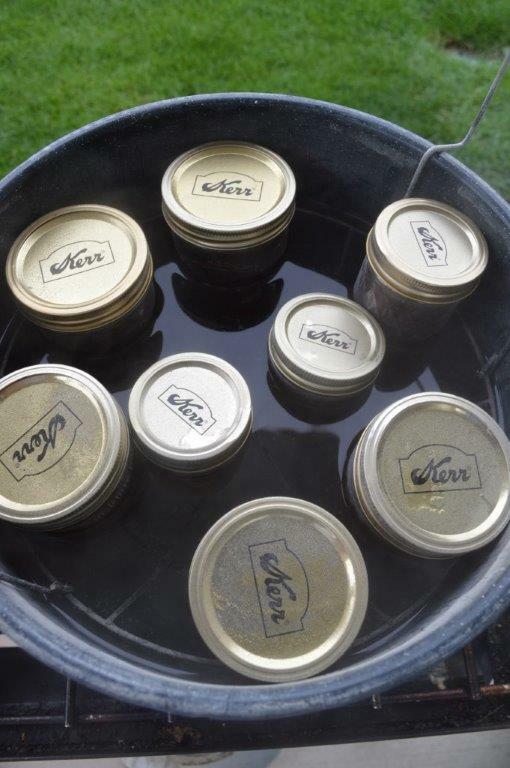 You will need 8 half-pint jars (to be safe), get these at the store, or watch for them at garage sales and thrift stores. 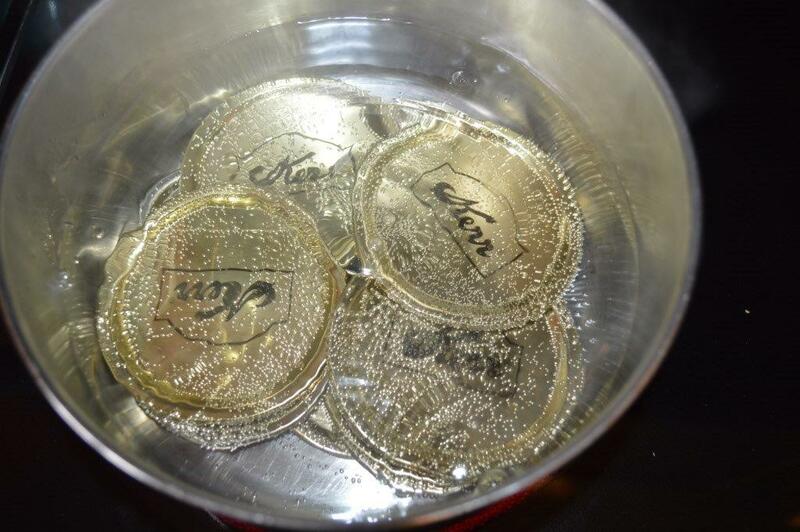 Check carefully for any nicks, chips for irregularities- toss out if there are any. ALWAYS USE NEW LIDS!!! Get narrow or wide depending on your bottles. 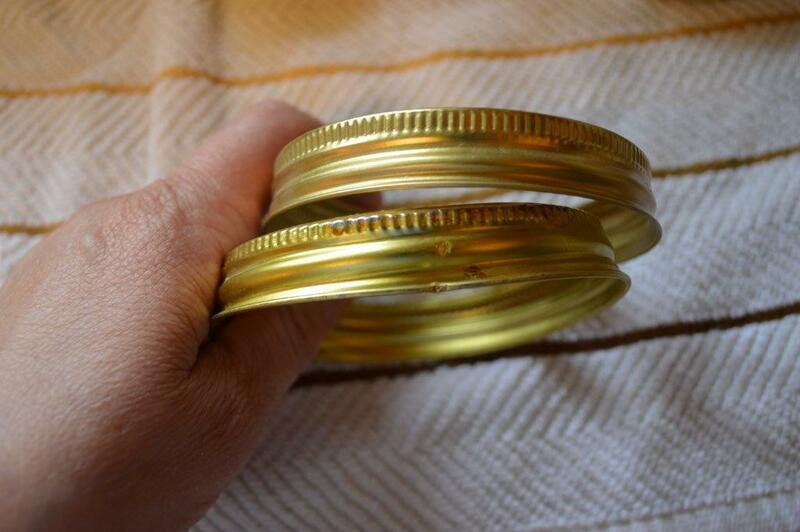 Rings can be re-used if they do not have any damage, rust or dents. 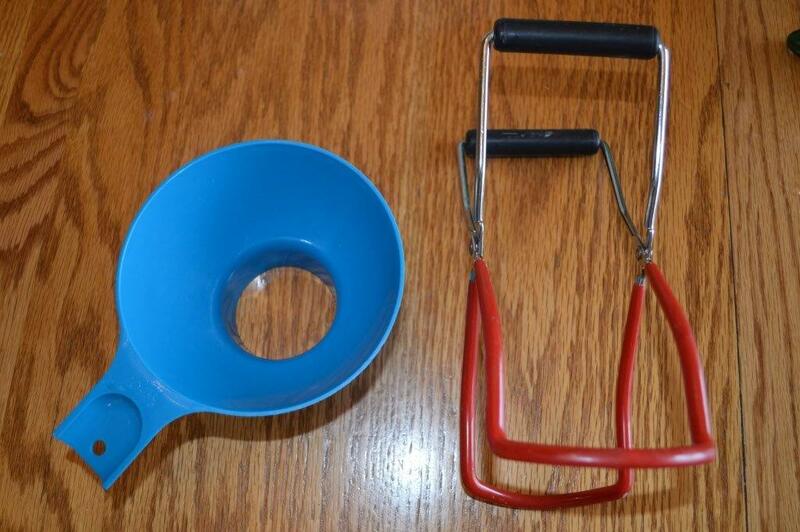 You need a canner with rack, wide mouth funnel, bottle lifter, towel(s) to set hot bottles on and hot pads to prevent burning yourself. 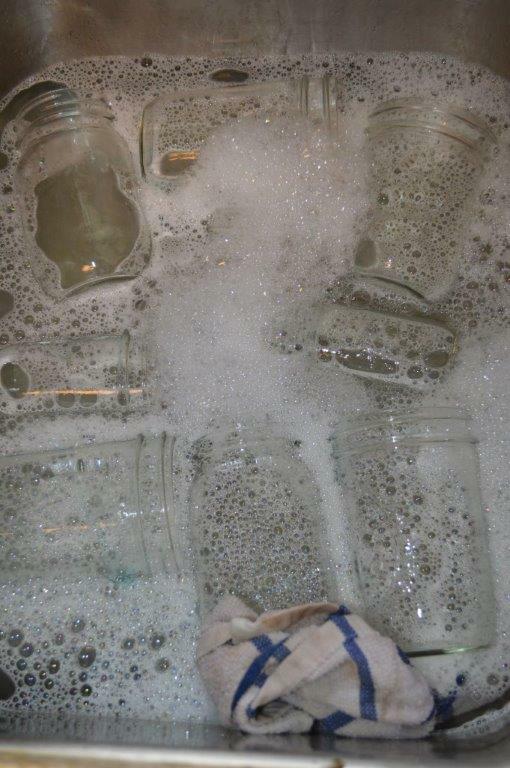 Wash jars and lids in dishwasher or in very hot soapy water. Keep in warm oven at 200 degrees. 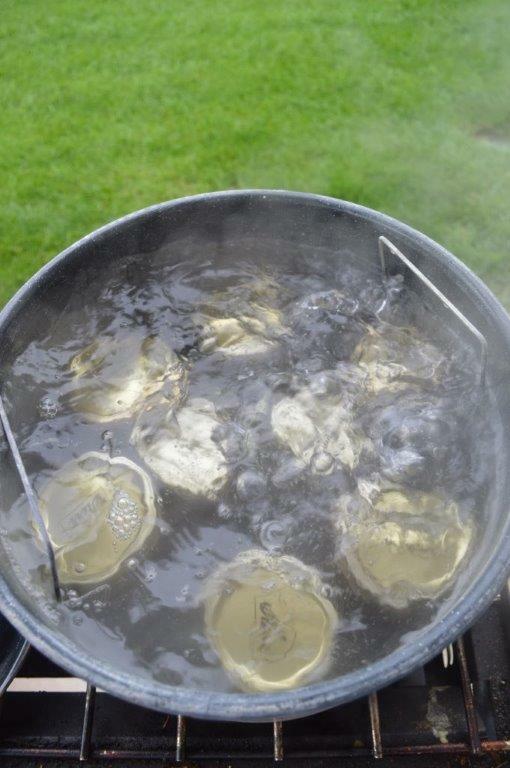 Put lids in small saucepan with enough water to cover. Bring to a boil. Take off heat and let sit while preparing jelly. 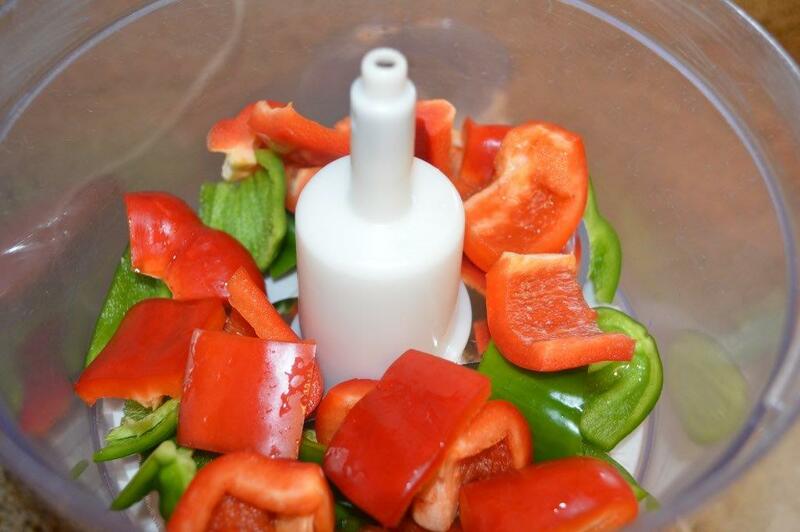 Stem and chunk red and green bell peppers, discard seeds. 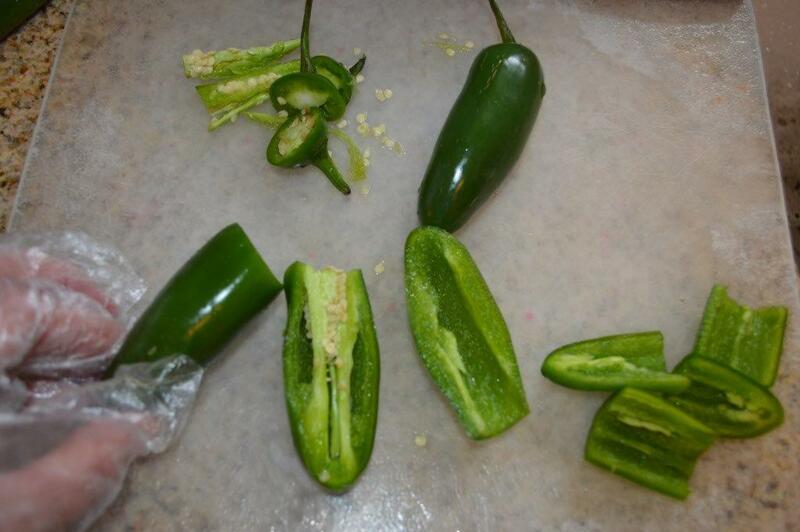 Wearing gloves, stem and halve jalapeno peppers; discard seeds. And chop all into small pieces. 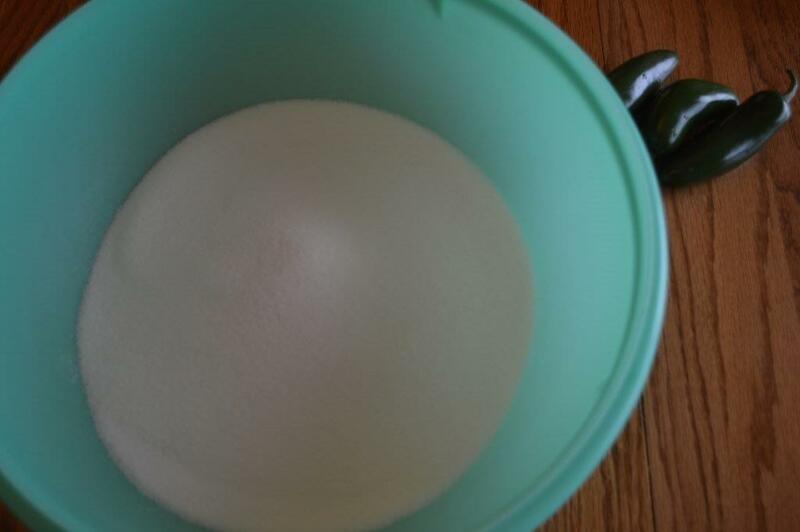 Measure sugar into a separate bowl. Cook for 12 minutes, stirring constantly. 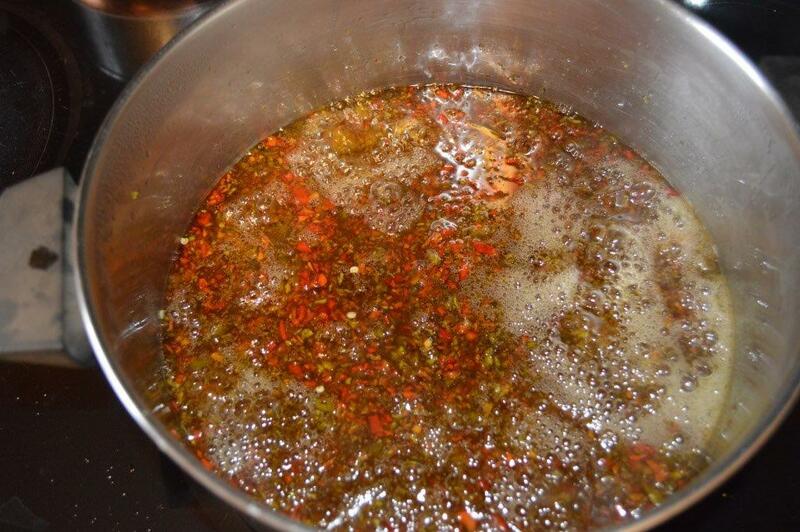 Stir in the liquid pectin and boil for 1 ½ minutes exactly. Take the bottles out of the oven. Place the funnel into a bottle. 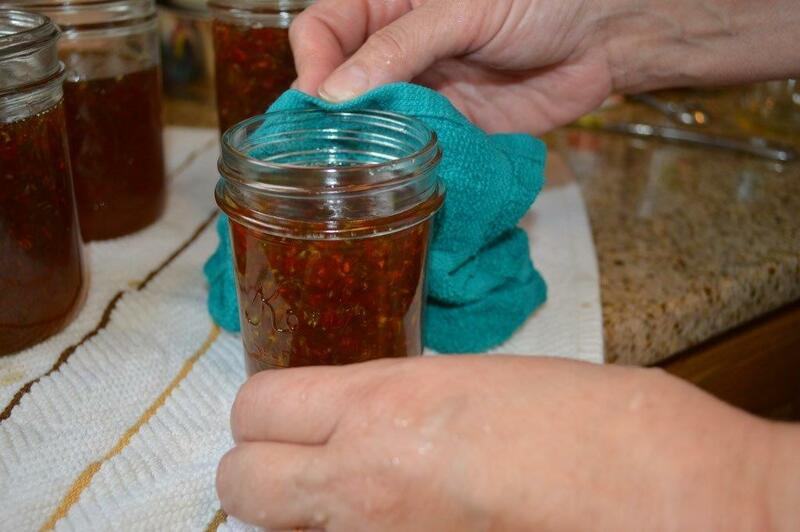 Ladle quickly into prepared jars, filling to within 1/2” of top of jar. 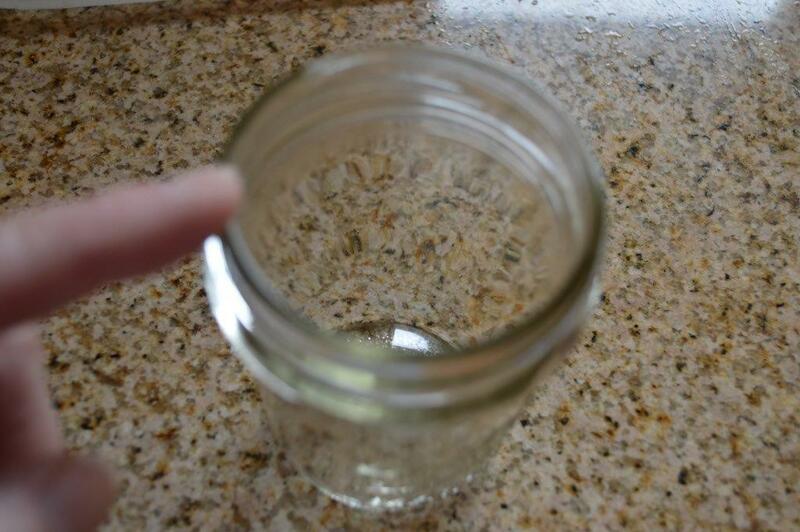 Wipe the jar rims and threads well. Cover with lid and ring. Screw rings (bands) on tight. 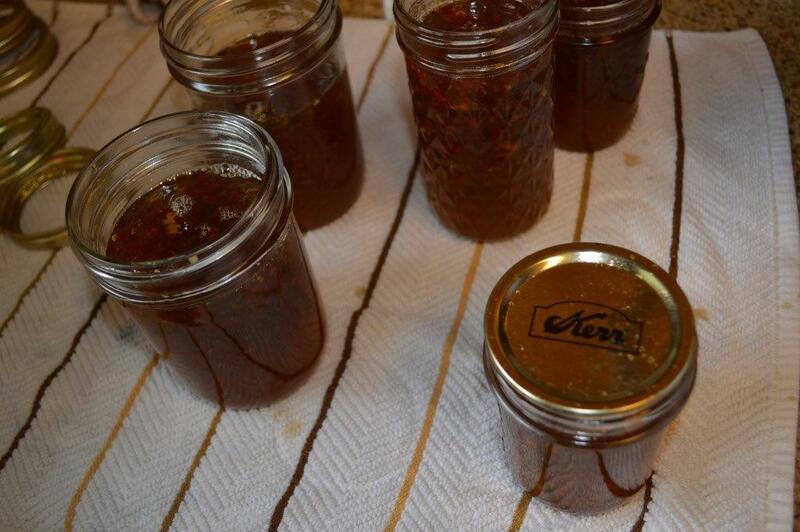 Oftentimes the jars will seal on their own at this point. 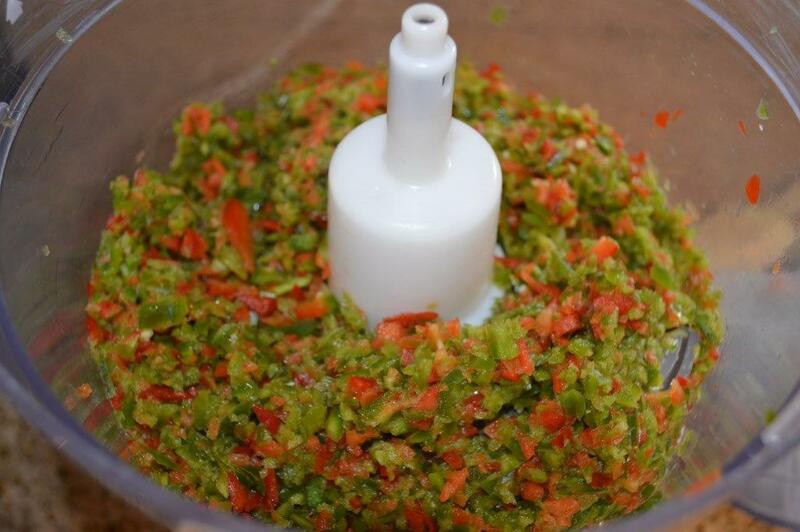 HOWEVER to prevent undetectable botulism, which cannot be seen, tasted nor emits an odor, process in the canner and use clean sanitized bottles. Process in water bath method recommended by USDA for 20 minutes. 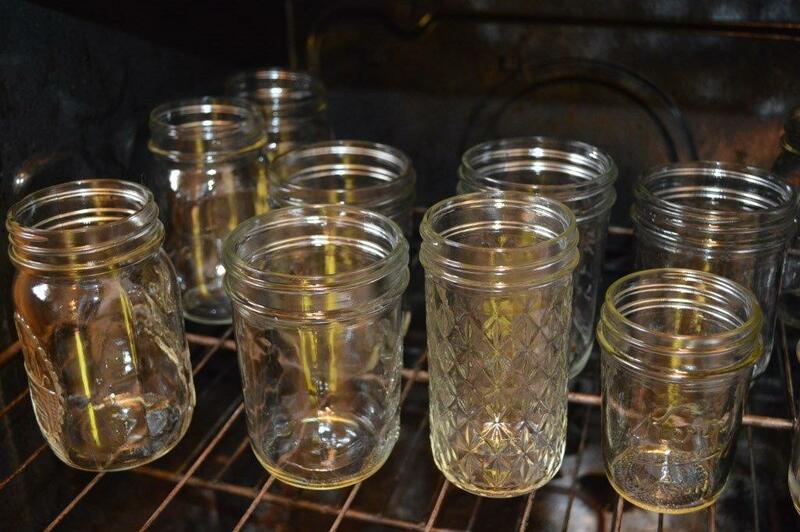 Place jars in the rack in the canner. 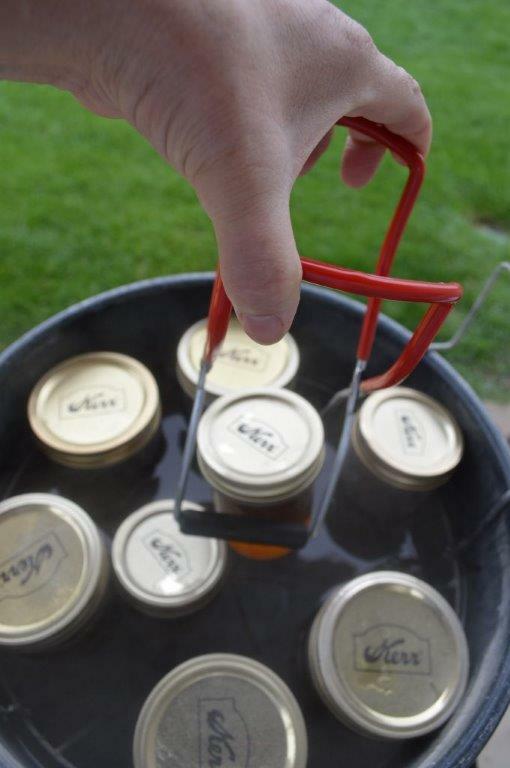 Carefully lift the rack from the canner. With a bottle lifter take the bottles out, one at a time and place upright on a towel (it is best to layer a few towels to prevent any damage to table underneath from the heat of the jars). Do not place bottles in a place where a cool/cold breeze from the wind, fan or air conditioner can directly hit the bottles. There is a great risk of bottles cracking or shattering due to the hot contents being affected by the cold air. Carefully tighten the rings again to just snug.Do NOT move! Leave it alone! Resist touching those lids! 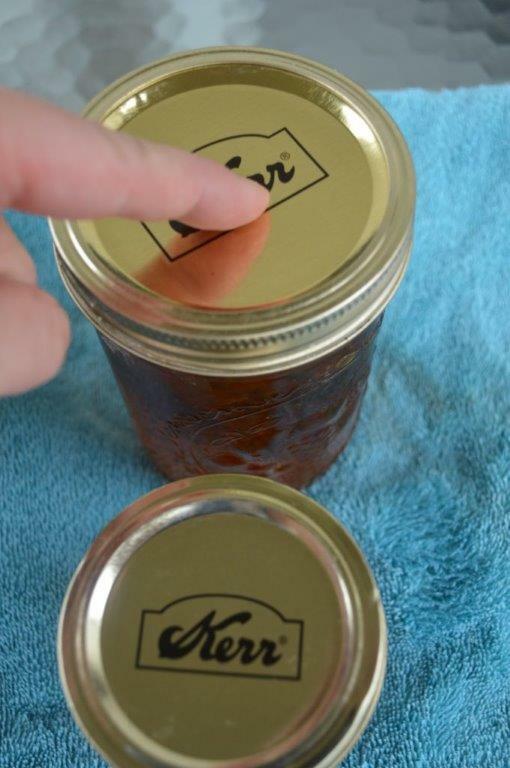 Now, check the seals/lids by pressing the middle of the lid with finger. 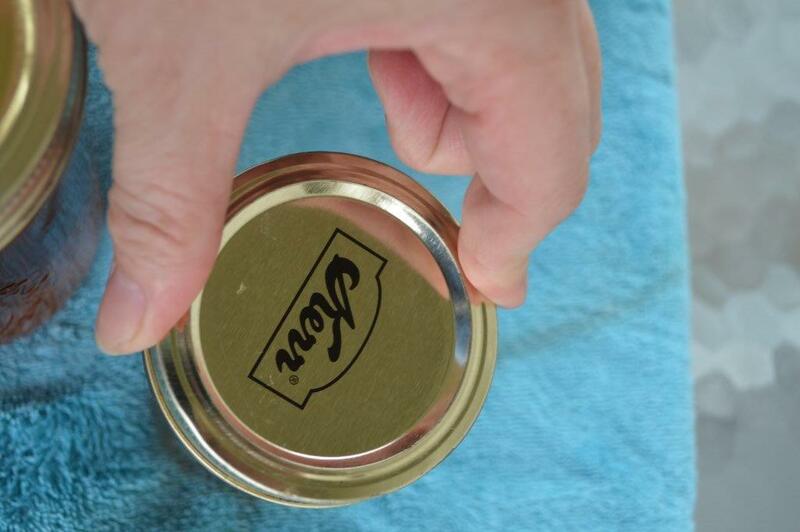 (See Below*)When the bottles have sat, are sealed, mark on the lid the year date so you can easily rotate bottles. 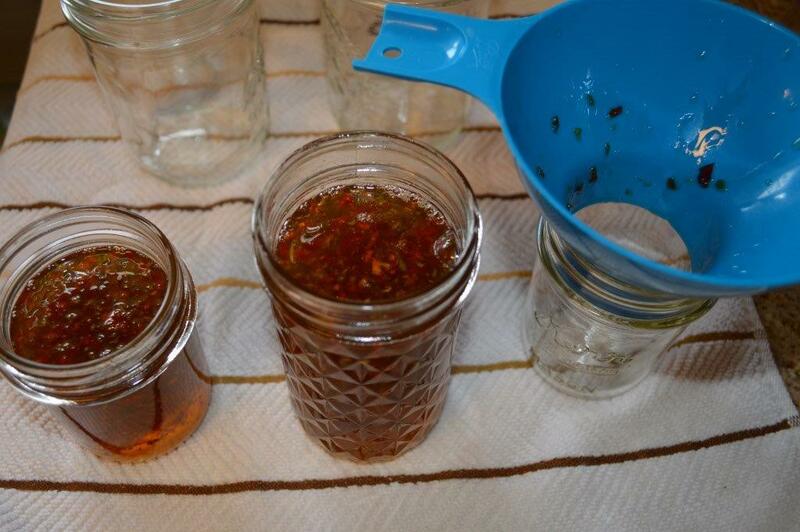 Makes 6-7 half pint jars. 1- Put in the refrigerator and use within 7 days. 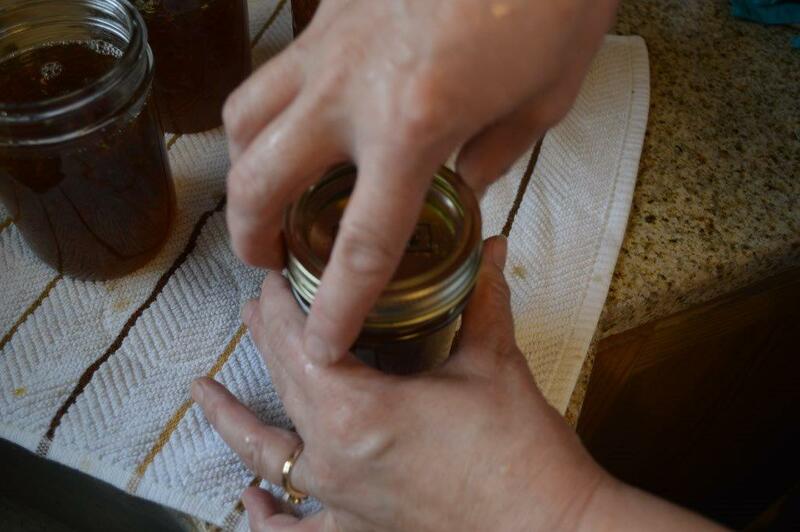 2- Remake from instructions from USU Extension Service: To Remake with Liquid Pectin – For each quart of jelly, measure ¾ cup sugar, 2 tablespoons bottled lemon juice, and 2 tablespoons liquid pectin. Bring jelly only to boil over high heat, while stirring. 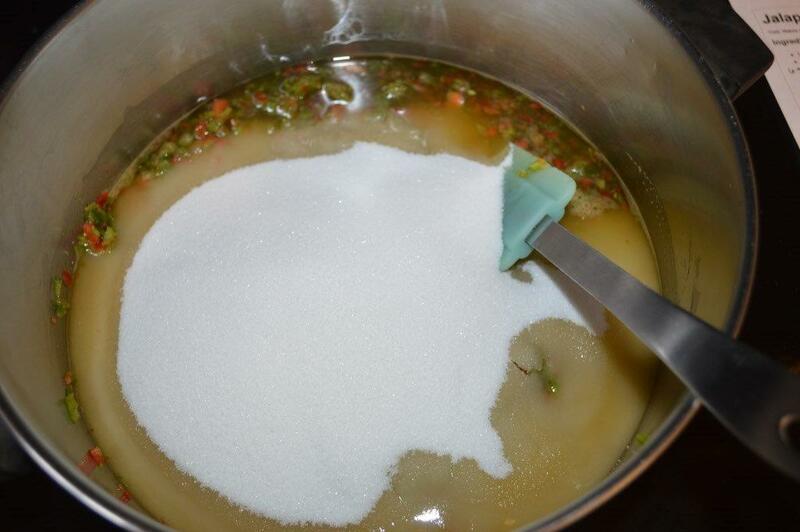 Remove from heat and quickly add the sugar, lemon juice, and pectin. 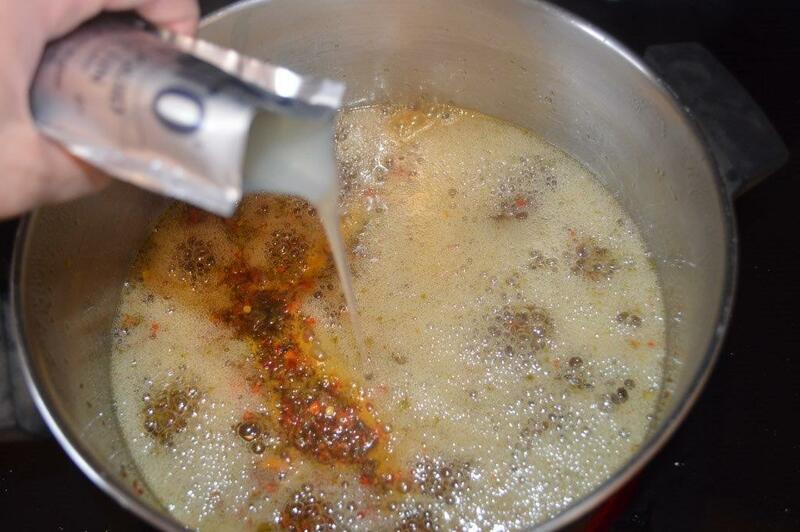 Bring to a full rolling boil, stirring constantly. Boil hard for 1 minute. 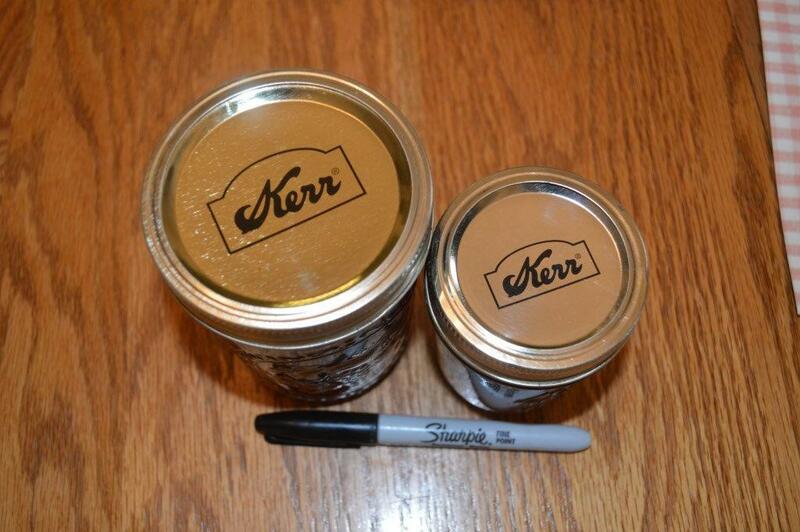 Quickly skim off foam and fill sterile jars, leaving ¼ inch head-space. 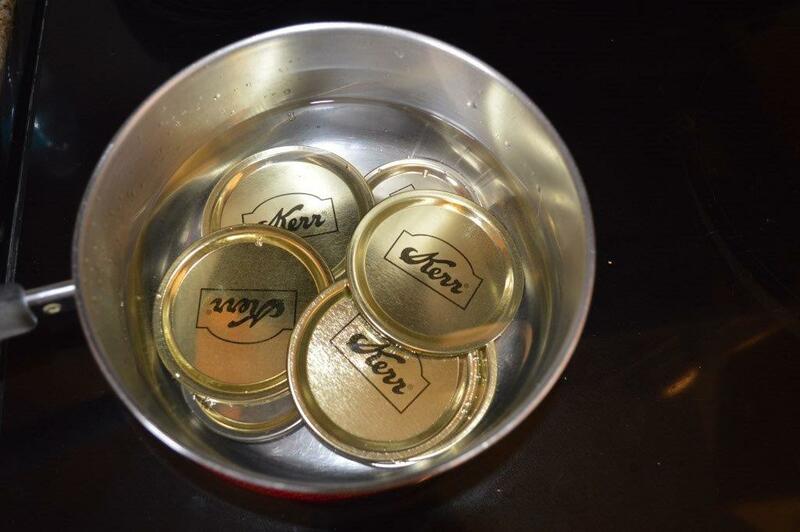 Adjust new lids and process as recommended in water bath for correct altitude.